Avid readers might recall me blogging about my move from Isle of Man to Åland, Finland (read part 1, part 2 and part 3 here), and how I safely arrived and rejoined my family after much travel and adventure*. This post is not about travel or adventure, but rather about settling in, adjusting to a new place to live, a new job and new home. Taking Lydia the dog for a walk late one evening, I ended up in a patch of forest near my mum’s house. It’s simply called Lund (as in Grove), and it’s a spooky place. You know that scene in Blair Witch Project with all the weird things hanging from the trees? It was like that, except without any weird things hanging from the trees. (Unless they’d temporarily been taken down to be repaired or something. That’s quite possible.) There was a palpable sense of evil about the place that made me shudder. No birds or other animals could be seen or heard, and in the distance I could make out the ghostly silhouette of the ancient church of St Lars with its thick black tower against the pale sky. Evil. Anyway, against all odds I made it safely home and the next day we went into Mariehamn to order a replacement mattress for our bed (the old one had been smoke damaged during the fire and had been discarded). This is when it turned out that they didn’t really sell mattresses in imperial measurements in Scandinavia. It would have to be special ordered. To an astronomical cost. Goddammit! Luckily, we were able to borrow a mattress from my dad’s summer-house for a while. Once we’d gotten all our stuff into the new flat, it started to feel like a proper home. Granted, we didn’t have much furniture set up yet and no internet connection, but the new telly was nice and big. And having that spacious kitchen all to ourselves was pure bliss! I also started my new job as a web developer for an online gaming company. The first week was a blur of new people, new routines and meetings. Lots and lots of meetings. And quite a lot of darts**. I was also shown around the two offices, meeting all the people and shaking a lot of hands. I can’t honestly say that I remember everyone’s name or what they do (it’s quite a big company), but they seem to be nice, decent people with a good sense of humour. My old battered MINI Cooper has also caused quite a stir. Not only is it right-hand-drive, but it’s a make of car not often seen over here. Also, the fact that I had driven it over here from Isle of Man made one of my colleagues consider bringing his own car over from the UK, especially after I told him that it wasn’t really all that hard and actually quite enjoyable. A troll forest – just around where I live! So, having settled in, life quickly fell into a new routine. Work, sleep, play with Baby girl and walk Lydia the dog. Oh! Speaking of which: the other morning I took Lydia for a walk, exploring the neighbourhood. Only yards from our flat, I found a path leading off the road into a meadow. Following the path, it soon split into two – one trailing along a wide open field and the other going straight into a dark threatening forest.. It was like a dualist choice between light and dark; good and evil. 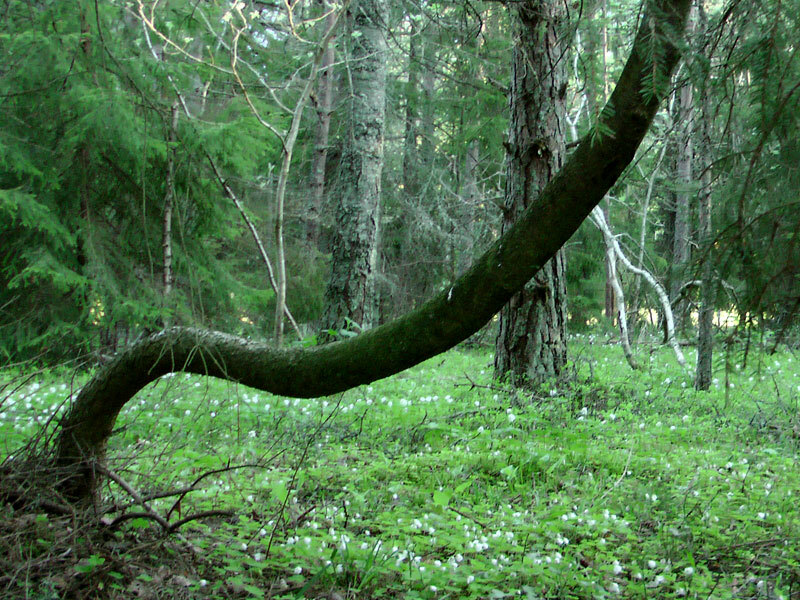 As soon as I was inside the dark forest, I noticed it was a proper troll forest, with murky old fir trees, fallen logs and plenty of pale white flowers***. It was very quiet and my own steps were muffled by the soft moss-covered ground. I must admit this is what I’ve missed the most living away from Scandinavia: the forests. It was so still and peaceful in here, with no distractions or.. Oh, look! An ant hill! What do you say, Lydia the dog? Shall we call on them? Let’s call on them and see if they’re awake! They were awake, but not particularly happy to see us, so Lydia the dog soon retreated to a safe distance. But I do like a good ant hill, and where there’s one there’s always another. Oh yeah, there’s one, over there. And a third one! Cool! 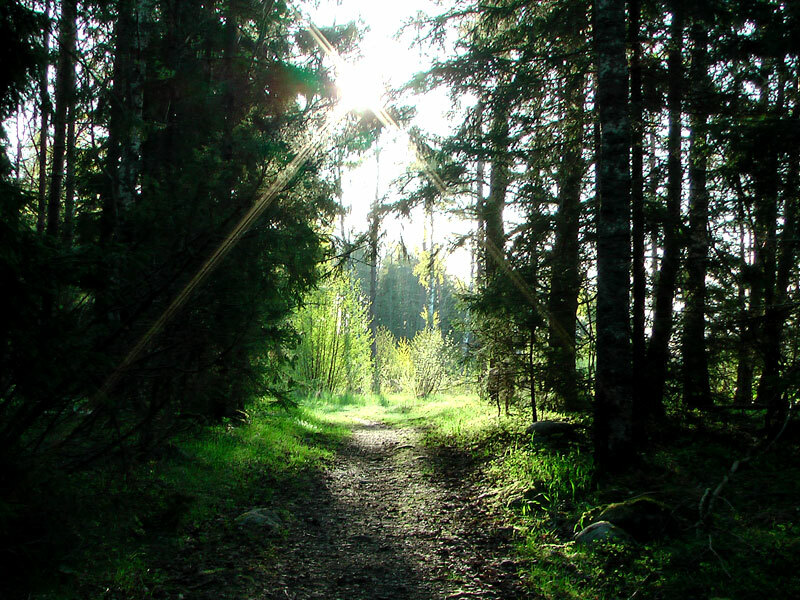 Walking back home, the sun rose above the tree tops, its bright warm rays piercing through the dense forest. It was very beautiful, almost magical, and I suddenly felt both happy and content. Yes: I’m glad to be here. 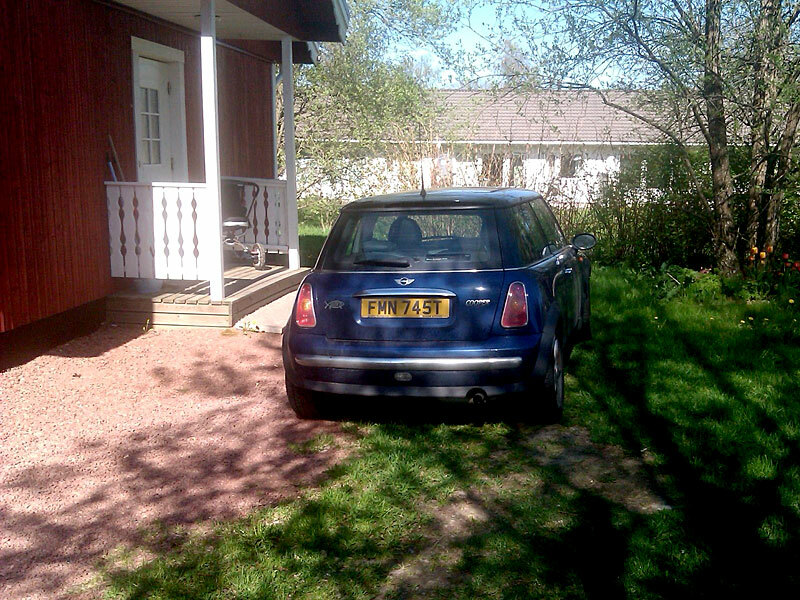 And so end my blog posts on my move from Isle of Man to Åland, Finland. Hopefully, my life will now be free of any more dramas and adventures and take on a more peaceful appearance of everyday routine. I’m quite looking forward to it..
* Not much adventure really, but quite a lot of travel. And interesting none the less! ** My new employer believes in a creative workplace, and provides a recreation room with a dart board, a pool table and a selection of games. *** OK, so they were just Wood anemones, but still..
I’m an avid reader! Me me me! I love everything about this post SO MUCH. I read it after work today and laughed and cheered. I have a million billion things to say. The Blair Witch tree is awesome and spooky and I love it. Assar the cat is so beautiful! I’m so glad nothing bad happened to him, aw! And ha, I love that he woke you up with the Finnish tango! (And now you HAVE to tell me what “What the hell” is in Finnish. Please please please?) *Picture might be arranged* made me laugh out loud. I didn’t know that’s what your new job was! That’s fun, right? That sounds fun. More fun than working at a tax firm! I’m glad you have a fun job. You deserve that. All of my people do. Your troll forest is beautiful! And so close to your house? We have one like that behind my parents’ house. I should take a hike and take photos when I visit this summer. I think I will. Just for you. You know that someday I need to send you a care package just to see the people at the post office freak out when it’s addressed to Åland, Finland, right? THIS WILL BE AWESOME. I’m so glad you’re there and you’re happy and you have internet now. I’ve missed you! You’re home! Yay for things working out like they should! Yes, I dare say you must be an avid reader! And thank you for liking my post. You’re too kind, I’m sure! 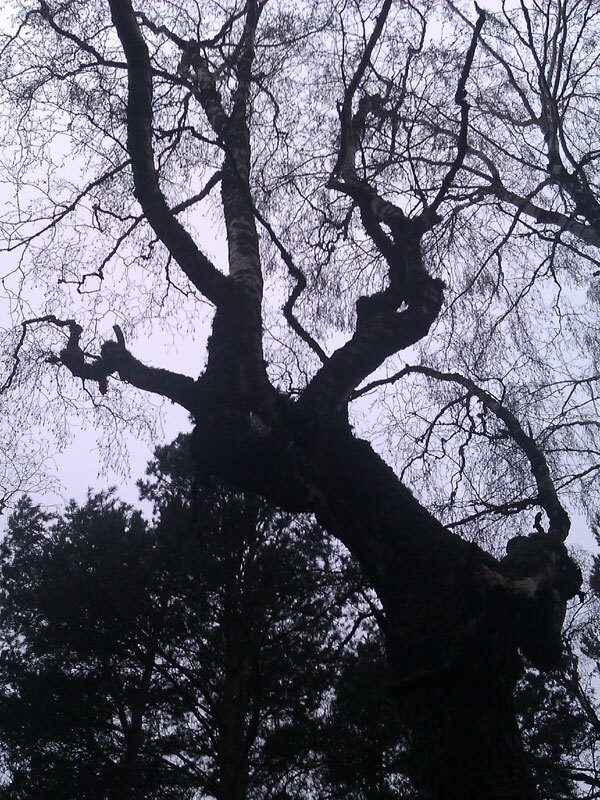 The Blair Witch tree isn’t just the tree – the whole place is spooky, but the other photographs turned out all blurry. Probably because of all the EVIL! But seriously. I’m pretty sure they performed human sacrifices or something there not long ago*. Assar the cat is a beautiful cat, this is true. He’s also the kindest cat: yesterday Baby girl grabbed him by his tail and started dragging him behind her. He just laid there slowly being dragged across the room without making a sound or trying to scratch or bite her. So so kind. The new job IS fun! And I’m really enjoying it. Not sure if I deserve it, exactly, but I’ll be damned if I would give it up! Hopefully you will one day also have a more fun job. I do like my troll forest. I’m pretty convinced that if I stay up all night and sit real quiet outside our flat, I’ll be able to hear the trolls dance in their forest. That’d be amazing! I am happy. And not just because I’ve got internet at home. It’s been quite a journey, but it’s been worth it! * Long ago: no more than 1,000 years ago. The other pictures were BLURRY? Yeah, that’s an evil forest. Tell your mom to be careful. 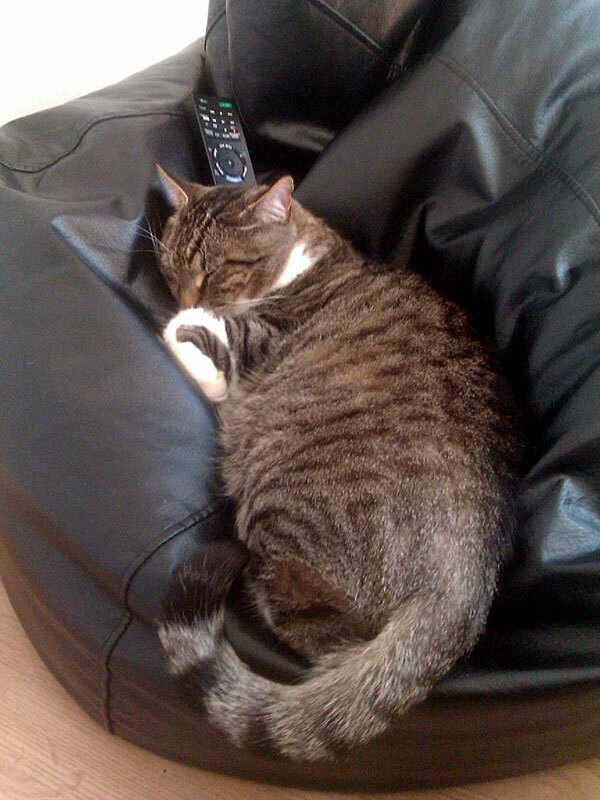 Aw, Assar the cat! Beautiful and also the sweetest! Dumbcat has only a nub of a tail. I’m sure he’s glad about that, because if anyone dragged him anywhere he would freak out and have to hide in the pots and pans cupboard for an hour to calm down. He’s not brave. Oh, I think I’ll be working the same bad job until I die. I am too lazy to look for another one. You TOTALLY deserve your job, of course you do! Listen, I only have a handful of people I’d rescue from eel-infested waters. Those people deserve ALL good things. Glad you liked my profanities! It’s pronounced “Men va’ FAAN!” Preferably said in a really annoyed tone of voice. Too busy to find a new job, more like. You have to PRIORITISE! When everything is up in the air for an extended time, it is such a huge relief when you can look around as you did and find yourself content with the resulting outcome. I am happy for you and yours. Thak you! Yes, it’s true. My life’s been up-side-down for so long I started to forget what it feels like when everything is just everyday routine. It is quite a relief to sink back into a more predictable and comfortable life. Ah, the hidden joys of not living in Dandara house. You do actually have space to swing (or tango with) a cat. Now, what are the chances of me getting darts in our place? Hmmmm. True. Plenty of cat-swinging space! And no: no darts in the actual work office space, that be dangerous! But in the recreational room downstairs, next to all the fruit plates and the coffee/hot chocolate machines. You could always get a set of those big foam darts and see if you can throw a bullseye..! You have a recreational space? We have one of those, it’s a little circular table where I sit and be lonely. Though maybe the office toilets are a sort of recreational space. It’s a gamble you won’t catch something when you leave. By the way, this is NOT Taggloo speaking, it is me, ProgramX. Stupid OAuth not working on WordPress. Hahah! Yes, I forgot about the little round table! So much less famous than the big round table of king Arthur. And WordPress is NOT stupid! Picnic! I am so happy you live near a troll forest! Everyone should be so lucky. Everyone really should! Still haven’t seen any trolls though..